Several readers asked what I was wearing in the video we produced recently for Begg & Co scarves. So here they are, one by one. Navy cashmere jacket by Solito. Not a great level of finish, but one of the most useful jackets I’ve ever commissioned. One to keep in the office. I have three pairs of these, splurged on years ago when I finally found ready-made gloves that fit me well. Although not as well made as the Merola ones I now prefer, the colour of these is lovely (even if they do rather resemble an old banana poking out of my breast pocket, as one reader pointed out). You can follow the discussion on Scarf outfits: Solito, Cifonelli, Anderson & Sheppard by entering your email address in the box below. You will then receive an email every time a new comment is added. These will also contain a link to a page where you can stop the alerts, and remove all of your related data from the site. That overcoat! As to the jacket, don’t you think a more structured shoulder would flatter more? 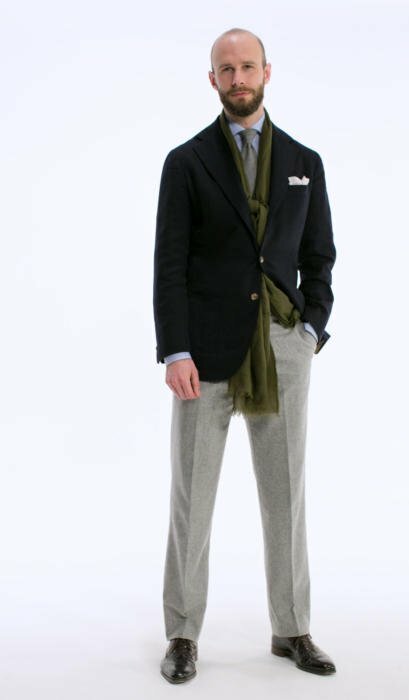 I have sloping shoulders and am tall too, I just feel that my soft tailored jackets are “minimizing” and get the eyes down to the torso rather than to the face given the low shoulders and long neck. Soft shoulders definitely have that effect, yes, but to be honest I quite like it. I also think the casualness, the informal look, is more important. As with anything, the key is to understand the benefits (impression of strength, of sharpness, of formality) and then decide whether you want them or not. You mentioned in response to a comment a few weeks back that you buy RTW branded items when the cut/ style justifies it. It would be good to know what RTW brands you have brought and why . Dear Simon, I recently read your informative post on Italian Mills from 29 July 2013 (I see that people are still commenting on it). My question is whether you can recommend any vertically integrated cashmere mills in Biella who will work with a small start up producing small quantities of cashmere scarves to a bespoke design? Any tips would be gratefully received. Thanks. I think you mentioned it in relation to a pocket square . Although on a more general point do you ever buy or would consider non-bespoke ? If so what ? And which brand? Apologies if I’ve misinterpreted . You look cool, Simon. I lost my Johnston’s ribbed cashmere scarf, but found a ribbed cashmere scarf replacement new in ebay for £20. Luck in unluck. As with others I’m always impressed but the cut of your trews. Could you please comment on the two important aspects of length and the width of cuff. I’ve looked at earlier posts (2008) where you suggest for formal trousers 16 inches circumference and 17 inches for jeans. Given the date has this changed? I note also the length of the (beautiful) flannels that barely have a break. I’ve had most of my trousers cut a little longer but am now beginning to rethink this…By the way congrats on the splendid, masculine colour palette of grey, blue, green and brown as shown in the first image. Excellent! I much prefer a 2 inch cuff with flannels. Personal taste – but these are a touch too long and too wide. Apologies for going off topic, yet again. I was curious on your approach to shirts, your photos suggest that with jackets you almost exclusively wear solid white, blue or grey shirts in oxford or poplin weaves. Based on the number of suites you commission I am assuming you also have wardrobes full of shirts, do you just have a multiple number of each of these options? Do you have/wear check/ herringbone/ stripes etc? Or am I over estimating the number of shirts you own? Must have forgot to sign in there.. I have asked Luca to bring a sample of the light blue chambray that he has made you before, i have never been able to get a good look at the pictures, always just zoomed in snippets under jackets etc. this seems less “denim” like than most chambray’s, which i think will mean it goes better with jeans (trying to avoid the double denim) Obviously i have not seen this cloth for myself how does it compare in the flesh. It’s nice, and would certainly work with denim. (A chambray is essentially just a cloth with irregular blue and white threads overlapping, so it can be quite varied). It’s very much a personal question, depending on what you value or not. But I would think it’s still worth getting. Simon, can you share the maker and perhaps code # of this chambray? Thanks. Hi – I just checked and this shade isn’t available for bespoke anymore I’m afraid. I think it’s the Blueberry range from Albini. Luca has some bolts of it though that he has in stock, if you want to get a shirt from him. Simon – this is a question about scarf lenght. It seems that nowadays scarfs run rather long and one needs to pass them twice around the neck in order to avoid the ends of the scarf to show below the end of one’s jacket’s quarters. (Which, for me, is rather unpleasant since it has a “phallic” undertone to it…). Your first picture is an example of the ends showing when the scarf is passed only once around the neck. Does Begg, or any other quality scarf manufacturer, makes a “short” scarf that would avoid this situation? Thanks. Thanks Simon. Is there a real chance that we’ll get a look inside your walk-in closet (or towering armories) at some point soon? I’d love to get a virtual tour (perhaps a short, or not so short video)! I would relish seeing your collection – divided or otherwise! ps – Your four “essential questions” to your accessories panel were thoughtfully crafted. Well done. A shallow question: Drake’s sale just went from 30% off to 40%. Looking at previous years is there a chance it may go further down or is 40% the end of the line? Just picking up on the wardrobe… what might be of interest to all would be a short video re. how you piece together an outfit choosing from the different elements in your wardrobe, simple but interesting. The image atop, as stated is an excellent example of the process of choice. On another subject as above, could you elucidate on ideal dimensions for trouser drop and cuff size. Many thanks. Thanks for the ideas, will do. The scarves here are solids as are the squares you designed. What would your take be on patterned scarves? Not as versatile? Thanks Simon. Love that particular check scarf. What is your opinion on buying a 100% cashmere overcoat?, I am in the UK, I am worried about the weather and the rain, do not want to spend huge amount of money to find that it is ruined quickly. 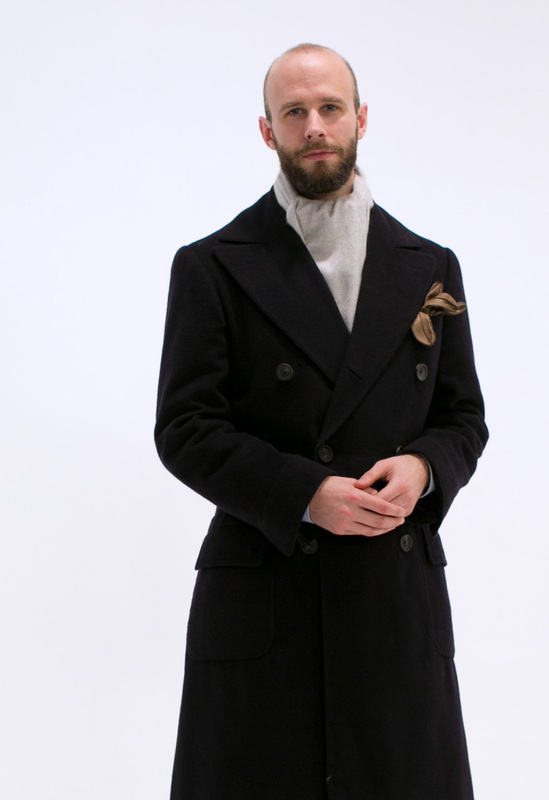 Is it worth spending a vast amount on this type of overcoat? The brand I am looking at is Johnstons of Elgin, is this recommended for an overcoat? I tried it on last week and it feels so good but I want to be really sure I want it and it is not going to be ruined by our great weather hear bearing in mind I use public transport a lot. Johnstons is a great brand – see the chapter on them in my Best of British book if you’d more info. Thank you Simon, useful comments, especially the one about lasting as long as wool, think based on that you have made my mind up to look for a wool overcoat, Pity but for the price it is I would like something that might last a while, although I do not expect I would wear this overcoat on a daily basis. When you say last, if worn 2 maybe 3 times a week and kept in excellent condition how long do you think and of course cannot hold you to his, haha just an idea! Thanks for taking the time in answering my queries. It’s hard to put a time on it, given there are so many variables in both use and the make of the coat (eg weight of cashmere) but I’d expect it to last a few years certainly. Hi Simon, does 500 GMS mean anything? JofE said that that is what the weight is, does help with anymore advice? Thanks for your patience with this. Hi Simon, I have another question, what is your opinion of a merino wool and cashmere blend overcoat, 90% MW and 10% cashmere? Will it last longer than a pure cashmere as you mention above. Thank you again Simon you have been really helpful, this merino blend is £350. But what do you think of this one http://norwegian-wool.com/collections/lyngen/products/copy-of-lyngen-br-100-merino-wool-br-textured-charcoal?variant=5682895171 is this a better option? It looks nice. I’d prefer a classic overcoat collar and buttoning, but if you like the look go for it. Also be good if the liner was removable. I’ll probably have to cut you off now if thats’ ok… People pay for this kind of consultancy! I can only afford one Begg scarf. Which should I chose? I would mainly use it with my olive Barbour or with my navy peacock. Wearing one of my Friday Polos today, I stumbled across this old post when browsing your site, and I’m curious – is the collar on the friday polos based on/the same spread collar as your dress shirts by Luca? I can imagine the collar looking quite nice with a tie, but based on pictures I’d say the polo has bit wider spread than your shirt collars? No you’re right, the spread is very similar. 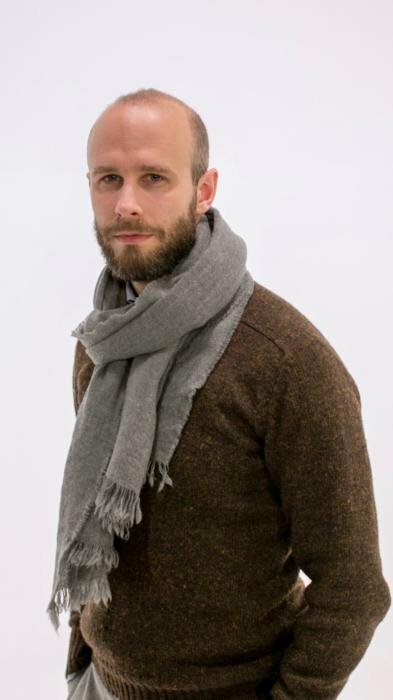 Simon- I’m a big fan of Begg scarves but to date the only ones I’ve picked up are their lighter weight cashmere. I wondered what you wear for the very coldest months. I see that Begg do a slightly heavier line but am not sure just how much warmer they would really be. I’m also not a fan of the traditional tassel finish. Thanks Simon – do you recommend anyone in particular for shawls? Simon, I’ve a lovely light grey Begg scarf that I wear with a dark blue wool coat. The issue is, every time I wear this combination, the Begg sheds considerably. Is this something you’ve encountered in the past and how do you tackle it? Do you simply accept that through the day it’s going to look as though a cat fell asleep on you? So do you actively look to avoid such combinations, ie retire a combination that results in this or do you simply accept this happens? hi simon, a styling question – I have a lot of brown/khaki/beige jackets…what kind (in terms of color/texture/pattern) of scarfs i should buy? Most rural colours should be nice with those – green, perhaps a burnt orange, a charcoal to tone things down a bit.